Enjoy your video games and multimedia content with Amazon Alexa control with the Optoma UHD51A HDR XPR UHD DLP Home Theater Projector. It uses XPR technology to produce UHD 4K on-screen images with compatible content and features HDR10 compatibility to produce a wide color gamut. It outputs up to 2400 ANSI lumens of brightness and has a 500,000:1 dynamic contrast ratio to help produce details even in dark areas of the image. The projector has two HDMI inputs for connecting your digital HD devices such as a gaming console, Blu-ray player, or cable/satellite box. Its two built-in 5W speakers eliminate the need for external speakers if none are convenient. The included wireless USB adapter allows you to control the projector with just your voice through your Amazon Alexa- or Google Assistant-enabled devices; for more traditional control options, you can use the included IR remote. Alexa compatibility allows you to power the projector on and off, adjust the volume, change the input source, control playback via the onboard media player, change the display mode, HDR picture modes, and the PureMotion setting, with your Alexa-enabled equipment. Google Voice Action compatibility provides projector control via the Google Assistant. Supported control functions include power on/off, volume level, input selection, USB media player playback, and more. UHD51A HDR XPR UHD DLP Home Theater Projector is rated 5.0 out of 5 by 2. Rated 5 out of 5 by Daljit from Awesome projector I have used the projector for over less than a month and it seems the picture quality is awesome. I really enjoy watching content on this one. Super sharp and natural colours. It does offer very less lens shift which means either you have to place it on the table or hang it on the ceiling for a fixed position screen. Rated 5 out of 5 by Lee from Great 4K Projector for the money Ive had the UHD51A for about 5 months now and I am very pleased with it. I am using it in a finished basement with very low ambient light and a screen. I am coming from a Benq 1070w. Pros: The Optoma supports 4K and HDR which looks very sharp and vibrant, especially with 4K blu ray discs. Content like Planet Earth 2 is pretty stunning and incredibly crisp. HDR movies with a lot of colors looks great (Infinity War, GOTG2, anything animated). I was also impress with the 3D, which is much sharper and brighter than the BenQ. Setup was easy and the additional features such as the media player and USB are useful. Cons: You will need to do some light treatment to your room. There is a 3-4 light bar around edges of the image. None of my friends noticed it, but it annoyed me so I used black felt to create a curtain around the screen. It actually looks much more like a theater this way. Also, like almost any projector in this price range, dark shows and movies tend to get washed out. This is not unique of the Optoma, but be aware if you are coming from flat screens. You wont get as inky blacks. I tend to use the Eco and Film HDR modes which are less bright, but once your eyes adjust provide better contrast, especially for shows in space or less colorful content (GOT, war movies, etc). Removing all light from your room helps, but does not eliminate this. The bright setting looks spectacular for saturated colors and sports. Lastly, it does take some time to switch between resolutions and modes. All in all, I am very happy with this projector. I would highly recommend this for a theater install where you can control the light and design a screen for it. If you have a brighter room, you may want to go with a brighter projector. Hello, the only difference between UHD51A and UHD51ALV is the brightness -- 2400 lumen vs. 3000, respectively. 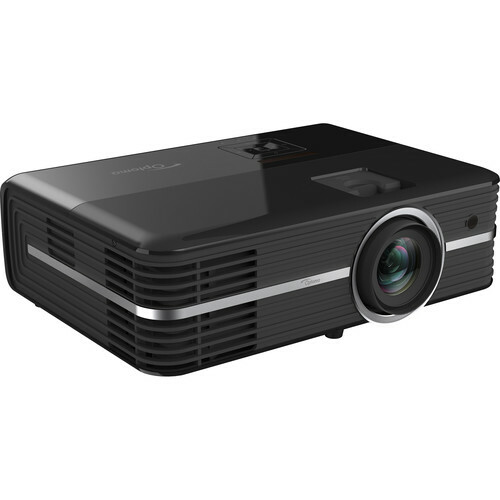 If you plan to use the projector in a room with moderate ambient light, we recommend the UHD51ALV. If you will have more control over the light in the room -- UHD51A will be OK. Also, please see my answer to your previous question. :-) Thank You. I think you mean you are &quot;living&quot; in the UAE. yes the Optoma UHD51A will work. it has auto switching power supply that handles from 110-240 volts and 50-60hz signals. If purchased in the US, the projector unit will come with a USA standard 3-prong plug, so you might need to purchase an adapter to connect to your electrical outlet in UAE, if it is not like the US style. Hello, the choice of projector will depend on the viewing environment. If you plan to use with some ambient light in the room (lights on) --- UHD51ALV is the best choice as it will provide the best balance between color and brightness. UHD51A is less brightness (thus the need less ambient light) but slightly richer color. Please remember, there is always a trade off between &quot;brightness&quot; and &quot;color&quot;. Hope this answers your question -- if not, feel free to reach out again. Thank You. Would this work in Australia? Our power is 230v at 50hz. Yes. Its supports power of 230 v.